I’ve used Triodent for years as my go-to matrix system. There are some very rare occasions when I’ll use a good old fashioned Tofflemire to build up the buccal and lingual, then recut the proximal portions and finish off with a V-matrix. However, the Triodent system works well for most large and small restorations, and I use it for almost all posterior restorations. This matrix system makes it much easier to get a nice contact between the teeth. The accompanying wedge system allows decent wedging of the gingival while the rings provide a margin of separation. It sits right down at the bottom of the tooth so it’s much easier to get the marginal ridge heights correct. There is a new version, the V3, but I’m still using the same V-ring system I first purchased at the Australian Dental Congress 12 years ago. There are also other brands that have all sorts of bits and pieces but I find this system so effective, I can see no reason to change. Of course, patients are unaware I’m using the V-ring system but they love the results. The outcome looks and feels fantastic and no food gets caught between their teeth. The greatest disadvantage is that it’s a little bit fiddly. 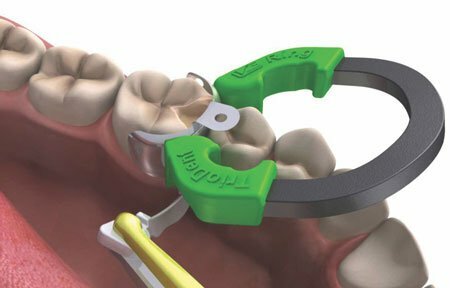 If you are dealing with a large cusp replacement, you have to do the buccal and lingual first so that you’ve got a decent proximal box for the V-ring to work on.